The American Kennel Club® is pleased to announce a new enhancement to the Grand Champion program – Achievement Levels. 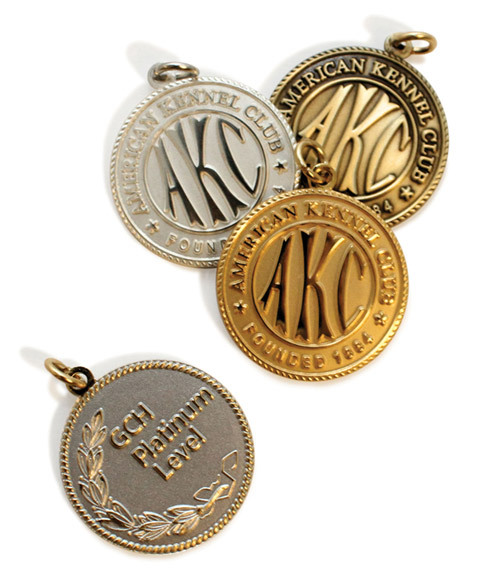 Beginning May 11th, in conjunction with the implementation of the 2011-2012 AKC Point Schedule, Grand Champions will have the ability to earn the Bronze, Silver, Gold and Platinum designations at AKC all-breed, group and specialty shows. For more information about the new AKC Grand Champion Achievement Levels, visit www.akc.org/grandchampionship or contact eventplans@akc.org. Home | Greetings! | About Us | Contact Us | Our Champions | Our Grand Champions | In the Show Ring | Medallion Rankings | Bronze | Silver | Gold | Coco Dam of Merit | The Boys of Prana | The Girls of Prana | News | Health Clearances | Breed Standard | Canine Gaits | Agility Competition | Available | Application Form | Papillon History | Point Schedule | FAQ | Our Family | Links | Location | Prana Site Search | Good Bye!